The Week in HD - Tuesday 8th May | What Hi-Fi? Hello everyone, welcome back to the The Week in HD, our guide to the week's HD and 3D films, TV shows, and sports. 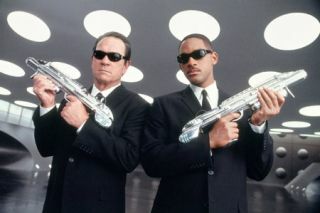 Will Smith dons the suit and shades once more for a third installment of the Men in Black films that's out later this month. So catch up with the Blu-ray release of the first two films. Steven Spielberg's adaptation of Michael Morpurgo's novel about the first world war told through the eyes of the horse Joey finally gets Blu-ray release in the UK, with plenty of behind the scenes footage. Legacy. Last in series about Shakespeare and the impact Jacobean rule had on his plays. His last plays, The Winter's Tale and The Tempest, are scrutinised here, along with the Bard's lasting legacy. This week, the ruthless (read: hilariously inept) contestants attempt to coax street artists into showcasing their work in a one-off gallery sale. Fun times. Bluesland. An entertaining travel through American's deep south, home of the blues, which looks at the origins of blues and the impact it had on the rest of music, from Louise Armstrong and Duke Ellington, to Chuck Berry and Elvis Presley. The Old Gods and the New. Now we know where Downton's Gwen went off to – to the north in search of Jon Snow. As much as I love Daenerys, she's going to have to be more political and crafty rather than just expecting everyone to fall at her feet, especially now that someone's stolen her dragons. Elsewhere in Westeros, Theon makes a decision, while Tyrion gives Joffrey a much needed slap. Three cheers for Tyrion! The Transporter Malfunction. Leonard 'Mr Spock' Nimoy guest voices in a battle with Sheldon's conscience as Penny buys the boys Star Trek toys. LLAP. Percussion Final. Five young percussionists vie for the last remaining spot in tomorrow's semi-finals. Reginald D Hunter is on the panel again, a more than good enough reason to tune into the satirical news show tonight, with Alexander Armstrong guest hosting. Spielberg. JJ Abrams. Aliens. Surely you don't need any more reasons to watch this excellent sci-fi film? Okay, how about six young amateur film-makers who find out they've captured an alien attacking their town on camera? And an electrifying train crash scene that's become a test favourite here at What Hi Fi? Sound and Vision. I'll repeat: Spielberg, Abrams, Aliens. F1's back with live coverage from Barcelona, with qualifying being more exciting this year now that it's no longer a given that Red Bull (well, Vettel) will inevitably get pole position. What's a supervillain to do when he finally defeats his superhero nemesis? Megamind is bored and aimless without a good guy to battle against, with Will Ferrell, Tina Fey, Jonah Hill and Brad Pitt voicing this animated film. Semi-final. The five winners from the keyboard, brass, strings, woodwind and percussion categories compete each other for a place in Sunday's final. Far more entertaining than any of the other 'talent' shows. Okay, so it's not strictly HD, but I can't ignore that LOTR is on telly. Set aside four hours to join the hobbits from the start as the Fellowship is formed and they make their epic journey to Mordor to destroy The One Ring. As the 2012 season arrives in Europe, Jake Humphrey & co present live coverage of the race from Barcelona. Ignore the silly plot and watch instead for some rather great special effects, as hell hath no fury like Mother Nature rampaging through the planet as global weather goes a bit mental. Final. The three finalists give their best performances to become the eighteenth winner of the biennial BBC Young Musician competition. This should be exciting.